Share your experiences with Versys X 300? 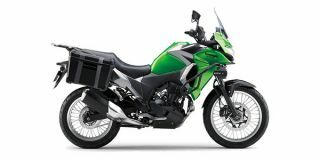 The Versys-X 300 is an entry-level adventure tourer, with the engine derived from the Kawasaki Ninja 300. In the flesh, the Versys-X 300 looks larger and more intimidating, owing to its adventure ready proportions. The front gets a nearly vertical windscreen, knuckle guards and two LED fog lamps mounted on a large crash bar that wraps around the fr ont of the bike. Interestingly, the Versys-X 300 is 5mm longer and 100mm wider than the Versys 650! Features include a set of LED auxiliary lights, front crash guard, knuckle guards, a single hard pannier and rear luggage rack. The 815mm tall seat is narrow so it is easy to place both feet on the ground. Parts quality and fit/finish are top-notch and the bike feels built to last. The semi-digital instrument cluster feels a bit basic and dated.